General Park News - (9/19/18) While the eastern US was dealing with the arrival of Hurricane Florence, Hong Kong Disneyland had to deal with the aftermath of Super Typhonn Mangkhut which ended up closing the park for a couple of days. A posting on Monday from Disney and More included photos of some of pathways outside of the theme park littered with debris as trees and branches appear to have fallen over everywhere, creating an atmosphere that would look more at home in a scene from The Walking Dead than at a Disney park by the time the sun rose. Part of the update showing off the site on Tuesday can be found here and shows a much cleaner environment, but still suffering from landscaping issues as fallen branches are piled up awaiting disposal and some of the bigger trees still needing to be cut away causing for some pathway closures. They then venture into the park, which has since reopened, and looks to be in pretty good shape, other than the occasional tree issue. They say a few attractions are closed, including the railroad, as the tracks are still blocked by debris in some sections, but in general it could have been a lot worse and the park should be back to normal in no time. (9/16/18) The latest update to Disney & More shows off footage and videos of the Halloween maze experiences now open at Hong Kong Disneyland this year, including the new Journey to Halloween Town. (8/17/18) Hong Kong Disneyland has announced a new addition coming to this year's Halloween Time event.... "Journey to Halloween Town". Themed to the popular The Nightmare Before Christmas film, guests will be invited to visit Halloween Town in this walk-through attraction where you will meet Jack and Sally... but be on the watch for Oogie Boogie! Watch the promo video for Halloween Time below to see some concept art for the new addition taking place from September 13th through to October 31st. (5/25/18) Disney and More has posted a video showing off the new Moana live action show at Hong Kong Disneyland. They also added a quick update about the Ant-Man & Wasp attraction replacing Buzz Lightyear, and mention that it will now open in 2019. Speaking of things being pushed back... the completion date for the transformation of the park's castle has also been pushed back to 2020. Make the jump to see the Moana video and new artwork for Ant-Man & Wasp as well as the new look of the castle. (3/17/18) Hong Kong Disneyland is launching the "Carnival of Stars" starting this weekend, a collection of new special entertainment offerings that will run through the summer. The additions include a new "We Love Mickey" projection show on Main Street USA, the addition of many new special characters to meet throughout the park, including new Marvel favorites: Blank Panther, Spider-Man and Groot. Elsewhere the park will put on various new musical and dacing entertainment acts in the park, a Disney-Pixar themed "Water Play Street Party", and in May the park will open the new "Moana: A Homcoming Celebration" stage show in Adventureland. You can read a bit more and see some of the new concept artwork over at Disney & More. (2/21/18) According to a report at Variety, Hong Kong Disneyland has experienced a third straight year of losses, losing $44.4 million in 2017, double the sum it lost from the two previous years. (12/12/17) As a Marvel fan, it’s always fun to see Stan Lee make appearances around living examples of famous Marvel heroes and villains. Usually we see this in the feature films which each always insert Lee into the action somewhere as a small cameo role, but in the latest update to Disney & More we get to see pictures of Stan Lee appearing at Hong Kong Disneyland to take on the new Iron Man Experience attraction as well as being honored as the Grand Marshal in the park’s parade for the day. March 2019 - Ant-Man & Wasp Attraction - (4/10/19) An even better looking video, from start to finish, of the new Ant-Man and The Wasp: Nano Battle dark ride experience now open at Hong Kong Disneyland can be seen below, shot with an excellent low-light camera system. (3/30/19) The new “Ant Man and The Wasp: Nano Battle” dark ride at Hong Kong Disneyland is now open and you can watch a video of the new ride in action below. (1/11/19) Hong Kong Disneyland finally revealed the opening date for the “Ant-Man and The Wasp Nano Battle” dark ride in a video teaser featuring Paul Rudd and Evangeline Lilly, which include includes some of our first looks inside the attraction itself which you can see below. Disney also released a breakdown of the storyline for the ride experience and how it connects directly to what takes place during Iron Man: The Experience next door. This high-tech, high-energy interactive adventure begins with a visit to the S.H.I.E.L.D. Science and Technology Pavilion, a newly opened facility at Stark Expo in Tomorrowland, set up to showcase S.H.I.E.L.D.’s latest technological developments. The seemingly ordinary visit is soon interrupted by Hydra, who has initiated a two-pronged attack in Hong Kong. Hydra not only is attempting to steal the Arc Reactor atop Stark Tower in Kowloon, Hong Kong, but its artificial intelligence Arnim Zola has sent an army of Swarmbots to infiltrate the S.H.I.E.L.D. Pavilion in order to steal a Data Core that contains highly confidential information. Oh… and look for Ant-Man and The Wasp Nano Battle to open on March 31st! Meanwhile, if you are visiting the park in the weeks just before that, keep a close eye on the attraction’s entrance, as Disney will likely quietly soft-open several weeks prior to March 31st. (11/28/18) Disney and More has posted a few more shots of the Ant-Man & The Wasp attraction at Hong Kong Disneyland where now it looks like all the large barriers have been removed, bringing the entire attraction area into the public view. They also note that there is a sign on the gift shop building that says “Opening in Late December”, but we should assume that means the gift shop, not the attraction itself which is still slated to open in March 2019, though I would assume it could soft open 3-6 weeks ahead of that. (11/27/18) A reader visiting Hong Kong Disneyland noticed that the large construction walls around the future Ant-Man & The Wasp attraction were taken down and they could get a picture of the attraction building, now sporting the SHIELD logo. (10/19/18) The latest promotional video from Hong Kong Disneyland now lists Ant-Man & The Wasp Nano Battle as opening in March 2019, alogn with some details about various celebrations and entertainment offerings coming to the park over the next year. (7/27/18) Hong Kong Disneyland has released a video interview with Paul Rudd (Ant-Man) and Evangeline Lilly (Wasp) where they not only promote their new movie (which is fantastic by the way) but also talk about the upcoming attraction opening in 2019. They also finally drop the official name of the ride... Ant-Man and The Wasp: Nano Battle. According to the official description, "When a routine trip to the S.H.I.E.L.D. Science and Technology Pavilion at Stark Expo takes an unexpected turn, guests join forces with Ant-Man and The Wasp in S.H.I.E.L.D.’s state-of-the-art vehicle to fight against Arnim Zola and his army of Hydra swarm-bots in a heroic battle. Paul Rudd and Evangeline Lilly, the stars of the “Ant-Man” films, also appear in this all-new, interactive attraction." (2/14/18) A few new details were released from Disney about the new Marvel attraction planned for Hong Kong Disneyland. "In the new attraction, guests will join Ant-Man and The Wasp to fight Arnim Zola and his army of Hydra swarm bots. This will be the second Marvel ride-through attraction experience guests can only have at Hong Kong Disneyland – including the new Iron Man Experience, already the most popular attraction – and just one part of the resort’s multi-year expansion plan through 2023, which will also include an entire Marvel-themed area." (10/14/17) According to a post at Disney & More, Hong Kong Disneyland has started work on their new six-year expansion plans that will once again expand the park with new attractions and themed areas, such as Frozen and Marvel, as well as enhance the park's central castle to allow for bigger and better show viewing. This will all start with the transformation of the former Buzz Lightyear ride into a new Marvel themed interactive-ride themed to Ant-Man set to open sometime in 2018. (5/4/17) A popular line of thought is that Disney would want to open the new Ant-Man themed attraction around the same time the new Ant Man & Wasp feature film hits theaters, currently set for July 2018. (11/23/16) While the Iron Man Experience opens in Jan. 2017 as the first Marvel themed attraction in a Disney park, it wont be the last. Tomorrowland seems destined to become the Hong Kong home to Marvel, and the park will "reimagine" the existing Buzz Lightyear Astro Blasters dark ride into a new Marvel themed dark ride that will allow guests to fight alongside some of their heroes. Based on the artwork shown, we can see guests in a dark ride with guns shooting at robotic insects alongside Ant Man. 2020 - Castle & Hub Improvements - (4/18/19) A new video from Hong Kong Disneyland this week checks on the construction status of the park’s castle, currently undergoing a transformation to become a much bigger castle icon for the park. (3/31/19) Some photos and a video posted to ThemeparX this week shows off the progress on the castle transformation and clearing for the new Frozen themed land on the way to Hong Kong Disneyland. (12/17/18) A video construction report from Hong Kong Disneyland shows off the progress being made in the park’s efforts to transform their castle into a much larger structure. (12/11/17) Hong Kong Disneyland posted a new image showing off the latest revised artwork as to how they plan on expanding the park's castle into a taller and more unique castle. According to the article the castle's design is now drawing inspiration from a number of different "storybook influences and styles", though I'm worried it is giving it a bit too much of a 'hodge-podge" look, instead of a flowing single style design. Take a look and see what you think. Construction will begin on the existing castle starting January 1st, though no date was given as to when it will be finished. Previous estimates had it listed as finished by 2019. (11/23/16) According to the park's press release a new and completely transformed Castle and Hub area will open with built in facilties allowing it to be used for new character shows in the daytime and as part of a new nighttime spectacular show after dark. 2020/2021 - Frozen Land - (6/22/18) According to a brief article from WDWNewsToday, when Disney builds new Frozen themed dark rides for Hong Kong Disneyland and for Walt Disney Studios Paris we can expect them to be near-clones of the Frozen Ever After ride at Epcot, which was created by using the former Maelstrom flume ride system. While I'm sure there could be a few years between now and when they start construction to change their minds, don't look for another clone to appear in Tokyo DisneySea however, as the Oriental Land Company has already requested something entirely different to be used at their park. (6/1/18) In the latest Disney Parks Blog, they show off some new concept art for the Hong Kong Disneyland multi-year expansion plans. The interesting thing is it starts off with an official release of that same image we first saw almost a month ago where it looked like a sleigh themed coaster had been added to the right side of the Frozen land. So I guess this is a new piece of artwork after all, and not an older one, as some theorized. Other pieces of art show off a new look at the Ant-Man & The Wasp attraction and an updated look at new Sleeping Beauty's castle. (5/11/18) According to one Screamscape source, this “new” Frozen artwork showing off a coaster is more than likely actually an OLD or Alternate piece of concept artwork Disney may have had made for the new land. This means that the outdoor coaster concept was likely removed from this older piece of concept artwork before Disney released the artwork we’ve seen for the past year. Looking at the two pieces of artwork in this new order, then you can see how various things were removed from it in the process of “value engineering” the land, such as removing the fountain, or the second large mountain structure, changes that would go towards lowering the overall cost of the land, along with the removal of the coaster. In the end, the land is still in development which means everything is still in flux until the construction begins, so we will likely have to wait for some time until we know the official final list of attractions. (5/5/18) This was news to me as well, but new concept artwork for the Frozen themed land coming to Hong Kong Disneyland has been altered and released and now shows a sleigh themed coaster on the hillside on the right side of the image. Other changes notices include the addition of a frozen-fountain in the plaza on the left and an additional mountain peak added to the horizon, to the left of Elsa's ice castle. I don't know if this was intentional, but the new peak almost has a "Matterhorn" style look to the peak to me. (5/4/17) Disney has confirmed on the official blog that the big expansion plans for Hong Kong Disneyland have been approved from the local government and that "starting next year through 2023" they will be adding new world-class attractions, entertainment and new themed areas. Already confirmed to be part of the expansion is an entire Frozen themed land. (11/23/16) A new land themed to the world of Frozen will open with two new attractions. Guests can explore the kingdom of Arendelle, meet the characters, and more. While I'm guessing at least one of the attractions will be a new dark ride, the other appears like it could be a 'dancing' ice sled themed version of the Luigi's Rollickin' Roadsters attraction that opened at California Adventure in 2016. 2023 - Avengers Themed Attraction - (11/23/16) The next phase of the Marvel rollout will open, this one will replace the Autopia with a massive new attraction that looks like it could be themed to The Avengers. ???? - Second Theme Park - Long Term Plan - (2/13/15) I'm told that Hong Kong Disneyland is hoping to push ahead with plans to build a second theme park across from the first one. This was always part of the total masterplan for the site itself, but one of our readers just returned from the park this morning where they spotted a group of height check balloons hovering over the site for the future second park early in the morning, across from the main plaza between the park entrance and fountain. 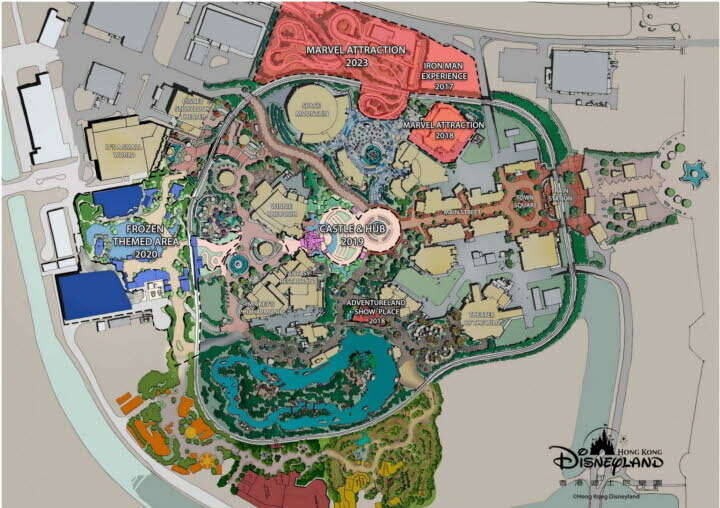 Visually, the two-park set-up here would be almost identical to how Disneyland and California Adventure are set up across from each other. Meanwhile the Disney & More Facebook page mentioned back on Feb. 9th that the Hong Kong Tourism Commission is now asking the Walt Disney Company to begin looking into plans for a second park as well now that the first park seems to be off and running well at last. 2012 - Big Grizzly Mt.